4x VINTAGE WATERFORD IRELAND CUT CRYSTAL COLLEEN 4oz WHITE WINE GLASSES - SIGNED. 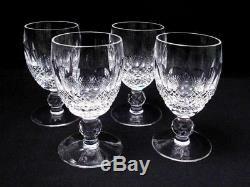 EXQUISITE SET OF 4 QUALITY VINTAGE WATERFORD CRYSTAL WINE GLASSES. Presenting a stunning set of four vintage cut crystal short stem white wine glasses produced by the quality Irish crystal producers, Waterford in the highly desirable Colleen pattern. Each of these elegantly shaped glasses features a traditional hand cut pattern which magnificently accentuates the stunning sparkle of the quality crystal. The elegantly curved bowls feature a beautiful faceted fine diamond cut to the lower section of each glass, with sleek, elongated oval cuts above. Each of these elegantly shaped crystal glasses stands proudly atop a wide and stable foot and exquisite facetted cut knopped stem. The sparkle of the quality crystal is exquisite and spectacularly reflects the light into rainbow prisms. The crystal has a beautiful ring when tapped. One only has to hold these exceptional glasses to feel the quality. Each piece has been beautifully hand cut, is perfectly balanced and is a true delight to hold and sip form. The facetted stems and oval cuts to the glass ensure these pieces fit wonderfully in ones grasp. This stunning set of four Waterford Crystal glasses are presented in excellent vintage condition with no chips, cracks or repairs. The crystal retains an amazing sparkle with no clouding or marks. This set has been exceptionally well cared for and present spectacularly. Each of these stylish Waterford Crystal glasses. Stand approx 115mms or 4.5 inches tall and measure 55mms in diameter at the top rim. Each piece is beautifully marked with an older etched "Waterford" mark to its base. This exquisite set of Waterford Crystal glasses would make a fine addition to any quality crystal collection or Colleen setting. Wonderfully elegant pieces which are sure to add a sparkle to any table they grace. A perfect gift idea for any discerning admirer of quality vintage cut crystal. Please take the time to view the additional sets of Waterford Colleen glasses we also currently have listed. International buyers are most welcome. Sorry, no personal cheques accepted. All items are professionally packaged using quality materials. We individually hand select quality vintage, antique, well designed and hand crafted pre-loved items, and proudly offer our finds for sale. We aim to describe and visually represent our items as accurately as possible. Get Supersized Images & Free Image Hosting. Auctiva's Listing Templates improve your auctions in minutes. Attention Sellers - Get Templates Image Hosting, Scheduling at Auctiva. The item "4x VINTAGE WATERFORD IRELAND CUT CRYSTAL COLLEEN 4oz WHITE WINE GLASSES SIGNED" is in sale since Friday, March 02, 2018. This item is in the category "Pottery, Glass\Glass\Crystal\Branded\Waterford". The seller is "threetreefrogs" and is located in melbourne. This item can be shipped worldwide.